Washington St. continuing to the left, Harvard St. to the right. The Panter's Building has been sold and renamed to the Harvard Hall building. 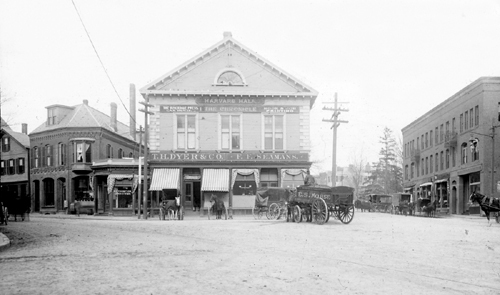 In the center are the stores of Thomas H. Dyer, grocer, and Frank F. Seamens, Groceries. Both would remain until 1904 when the building was replaced by the building that stands today. To the left, at 259 Washington St., is the store of Nelson C. Thompson, who took over the furniture and upholstery business from his father. E. S. Morse is seen making a delivery of what is likely coal. The red brick National Bank building, on the right, is still in use today.